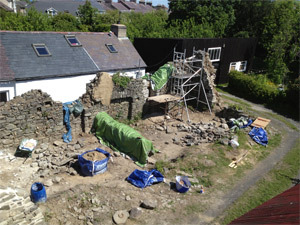 Repairing the ruins of a Tudor Hall or Naith in Llanon for Ceredigion Museum Service. We carefully excavated no less than ninety six tons of overburden or rubble and earth from the inside of the old ruin that had amased over the years and very carefully took off the ivy that was growing in to the walls before pointing with lime (provided by Ty Mawr Lime near Brecon who also had volunteer's working on-site on one of their training days on the use of lime so they had better understanding of why we repaired the walls the way we did) between the stones and capping the wall tops in order to stop further decay. 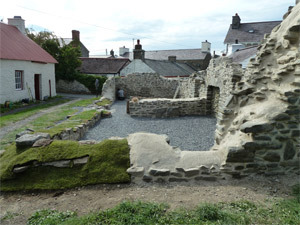 This project was run by Carrie Canham from the Ceredigion Museum Service from Aberystwyth. I was asked to make good all that was earthly possible we managed to save around 98% so a reel success. 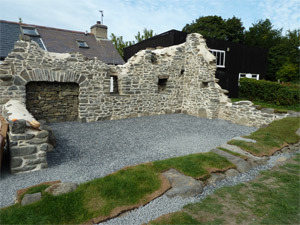 Dyfed Archaeological Trust carried out a trial dig and excavation with volunteers and when they had finished I backfilled the trenches and put a giotech membrane down and covered the site with small stone so it is now flat and safe for public to visit, the back filling is all reversible in the event that further excavations should be carried out. There are information signs newly erected describing details of the hall and the thatched cottage (under tin and adjacent to the hall) which I also worked on in order to safeguard this museum for the future - moistly associated with managing damp and humidity in a cottage that has no heating and no fires and also seldom any ventilation. 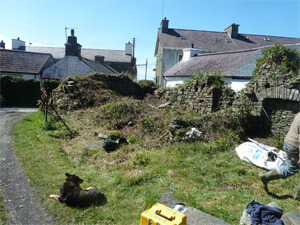 This cottage is now a lot better managed than previously although lovingly cared for by the museum service and the friends of Llanon Cottage volunteers who keep things ship shape for visitors. Now open on selected times throughout the summer although covered in tin the thatch is intact underneath and from inside the original straw rope under thatch is clearly visible and a rare sight indeed.